Thanksgiving celebrations are often a time for people to reflect on gratitude for the wonderful people and cherished memories they have in their lives. At an informal dinner, this may be done round-robin style, with everyone offering up reasons to be thankful. At large formal dinners, this is often done in a Thanksgiving toast by the host or honored guest. Writing a toast off the top of your head can be a challenge for even the most eloquent of speakers. Get started putting together some common elements and then tailoring the toast to the Thanksgiving occasion. Keep an outline of key points on hand for reference, so you don't forget what you want to say. Select one of the categories below to get started. 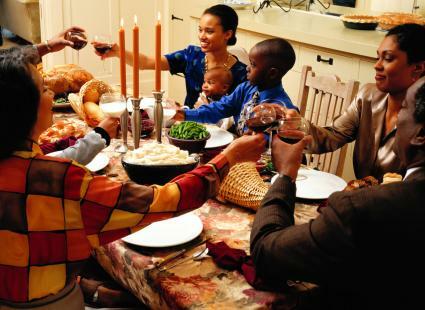 One of the best ways to toast is to mention the reason everyone has gathered - to celebrate the Thanksgiving holiday. Include a little information about why Thanksgiving is celebrated, fun or informative facts about the holiday, or quotes from famous people about Thanksgiving. George Bernard Shaw once said, "There is no love sincerer than the love of food." Once again, we gather to celebrate the harvest, to look upon the bounty of this table. We know that the real bounty is not in what lies before us -- though it does smell delicious! -- but in what lies within us, the bond that connects all of us as one human family. We remember those who have given us the freedoms we now cherish, and we look toward the future and the many blessings it will bring. To today's gathering and many more to come. Cheers. The first Thanksgiving was held as a celebration of life, of the fact that the Pilgrims survived difficult odds and made it through to the next year's harvest. Like those early settlers, our family has faced many challenges, but we always emerge stronger and closer in our bond. I am so very thankful for all of you here today. We made it through another year, together as always, in love and friendship. I am honored to be your host for this bountiful feast prepared with just as much love as you all have provided to me. Cheers. Talk about thankfulness in everyone's lives. Speak about gratitude for both the large and small gifts in life. At a small gathering, it may be appropriate to include a short sentence about each person in attendance and how you are thankful for each one of those people. At a large dinner party or corporate affair, speak about the group as a whole, including their collective spirit and accomplishments. I'd like to begin the meal with my personal thank you to all the family and friends in attendance. Mike, thank you for being the best husband a woman could have; I mean it. Marsha, you are a wonderful and supportive sister with a great taste in shoes. Bill, you know we would all be lost without your kind spirit and ability to find half-price airfare. Bethany, I'm so glad to call you my new sister-in-law. Cherie and Terry, we love your excitement, even when you want to play in the snow at 8 a.m. when we would all rather be sleeping. Thank you, every single one of you, for being here today, and for being in my life all year. I'm glad we have such a large group this year; it's the only way I'll be spared from a month of turkey sandwiches. [pause for laughter] But on a serious note, I am truly blessed to call all of you my colleagues and many of you my close friends. Hopefully, by the end of tonight I can transition all of you over to the close friend column. When I look at this group gathered here today, all I can think of is how wonderful that all of us can take some time out of our busy lives to share a meal together. To remember that this holiday is not about rushing to the mall to get the latest gotta-have toy, sitting in traffic leaving the parking lot, or sitting on the computer trying to get that last budget report in. It's about relaxing, spending time with people who matter, and let's not forget -- the food. Cheers! Many people use Thanksgiving as a time to reflect on what has passed since the last year. At a family gathering where everyone is of like minds, it may be suitable to mention a few general comments on current topics relevant to the family, such as a new baby, marriage, children going to college, or even global events of concern. Remember when Aunt Marnie used to say, "Thanksgiving day is in the same month as election day so that we can drown our sorrows in gravy?" Well, that is certainly true this year as we saw some of our faves get trounced in the midterms. But, since we can't all afford to move to Canada, we better focus on all the things that went well. First of all, the marriage of Camila and Jeff. Can I just say, what a beautiful expression of love? And, of course, Bella graduated from Yale and started her teaching career. Can you believe it? One year ago, she was just starting her internship. Now, "Miss Bella" is one of the most-loved instructors at Mt. Hood Academy. In fact, everyone here has grown so much since last November. And my love for you all has grown too, if that is indeed possible. Now, before I burst with pride, let's eat! I think the key word for our family this year is strength. We made it through some tough times: Frank's layoff, Julie's diagnosis. We made it through some good ones too: the arrival of Emma, Frank's new and even better job. How did we make it through the maze that was 2014 without being worse for wear? We did it together. We provided shoulders to cry on and shoulders to climb on. We laughed together and we worried together. We remained a family when it matter most. That's what I'm so grateful for, this year and every year. Thank you for being my rocks. At a formal affair, keep politics and religion to a minimum in a Thanksgiving speech to keep from ruffling the feathers of other guests. Tailor the toast to include information about the company at a corporate affair or some general philosophical thoughts on gratitude and gratefulness in life at a larger dinner. Having an attitude of gratitude is essential to leading a good life. That's why I make a list every morning of things that I am thankful for. This morning's list was the names of the attendees of tonight's dinner. I'm so glad that all of you could make it. Some traveled thousands of miles and some just walked a few hundred feet. Either way, I am so happy to have you here to share in the spirit of Thanksgiving. Although having everyone share their gratitude lists with the group would have us eating dessert on Christmas Day, I invite you to share with your neighbor and introduce yourselves to anyone around you that you don't know. Today, we are all family, and whether we are related to each other or not, we can certainly relate to each other. Cheers. Thank you all for joining us. It's been a long year, but it's been a great one, evidenced by just how many of us are here sharing a table. As we enjoy the feast of Thanksgiving, I invite each one of you to think of all the things you are grateful for: be it the crisp autumn leaves, your winning fantasy football team, or the look of wonder in Austin's face as he eyes the pumpkin pie. Try to remember just how fortunate we all are to be together on this special day. It's not often that we all are under one roof and I cannot state enough what a blessing that is for me. Cheers. When to plan the toast is truly up to the host and speaker. Ideally, the toast is delivered just before dinner is served or just after the meal has ended, either before or after dessert. The speaker should signal the toast by tapping a glass with his or her knife. If this is your first time hosting Thanksgiving, you may want to give a head's up to guests to expect a toast so that no one jumps the gun on helping themselves to a plate. Some people get so nervous making their speeches that they forget to actually make their toast. Make sure you ready everyone with drinks beforehand. Champagne and wine are commonly served drinks during toasts. However, some guests may prefer mixed drinks or non-alcoholic drinks. Make sure everyone has a glass to raise, even if it's just filled with water. No one likes to be left out of this special moment.